PGA professional Josh Barilar critiques a golfer's form. Golf can be a tough game to get into. Walking out on a driving range or course with golfers hitting balls as far as the eye can see can be a very intimidating feeling. This past week the River Course at Keystone Golf Club provided a remedy to this fear with its annual Betty’s Golf Clinics. The clinics focused on getting women passionate about the game of golf. “I feel that there are so many benefits of playing the game of golf. We just want people to come out and experience the game, and become core golfers,” River Course PGA professional Phil Tobias said. The clinics were free of charge, and rental clubs were provided. There was a specific focus for each day of week. For instance, Thursday was chipping; instructors had the women practice a variety of chipping scenarios, such as hitting out of the sand and short-distance approaches from the range. “It’s pretty scary being in the sand, but you’ve got to learn how to play from it if you want your ball to get out of there,” said Nina Jannetti of Breckenridge. A demonstration was given for each situation by the four instructing professionals. Teaching the mental aspect of the game was a strong focus for the week because if conquered, it can make a big difference in a player’s score. To harness the mental side, instructors brought out unusual items such as a broom, basketball and a padded duffle bag. “If you can use an aid, it takes the mind off technique and what they’re doing at the time. They can also refer back to that aid when they play in the future,” Tobias said. Women of all skills and ages showed up for the clinics, but over half were self-described beginners. Brittany Craig was about as green as it comes when the clinics started. “I would literally miss the ball almost every time I swung. I would get so frustrated, but I only miss once in a while now, which has helped me build confidence,” Craig said. Cici Karl is a more experienced golfer who wanted to bring her skills to a level where she can play competitively with her husband. Karl’s focus for the week was using a looser grip on the club. “My mentality has been: I see the hole so far away and I just want to hit the heck out of it,” she said. A looser grip with a more controlled swing makes for improved accuracy and better contact. 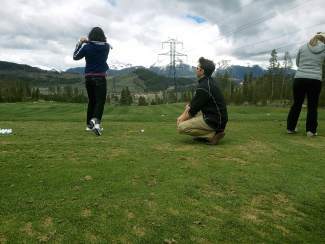 Others, like Nicole Guidi, focused on more basic principles, such as stance and posture. “All I want to be able to do is make good contact with the ball and have good posture while doing it,” Guidi said between swings. Just like in any sport, being in better shape will help you play better golf. Following Thursday’s clinic, representatives from Howard Head Sports Medicine provided demonstrations of golf-focused fitness workouts. Various strength and flexibility exercises were performed including windmills, dead lifts and squats. Above all, the purpose of the week was to create enjoyment for the game. “As instructors our passion is getting people excited about golf. On Wednesday some of our instructors spent an extra hour teaching these women on the range because that’s just what we love to do,” Tobias said. By Friday, things were really starting to click. Throughout the week, the clinic built incrementally from putting on Monday to full-swing practice on Friday. By developing their swings from the ground up, the golfers were given a fundamentally sound form to work with on the last day. Golf may appear scary at times, but the women in this year’s clinic are proof that intimidation can be overcome with the proper instruction and setting. “I think a lot of women are intimated by golf because it’s a male-dominated sport, but playing with all these women provides a new outlook,” Guidi said. Howard Head will be giving another free demonstration July 2, in Studio K at the Keystone Village.